REM Web Solutions is pleased to present the latest issue of WebWiz@rdry, our quarterly online newsletter. The purpose of WebWiz@rdry is to help our subscribers maximize the effectiveness of their web site, thus providing them with expert advice and keeping them current on trends in the web world. This is the sixth part of a multi-part article on how to improve your search engine rankings (SEO) using WebWiz@rd and other methods. My last blog post talked about using xml site maps to help google properly index all the pages in your website. We did this by setting up a google and bing webmaster account and provided it access to an xml sitemap that we automatically created. Part 6 of "How to improve your search engine rankings (SEO) using WebWiz@rd and other methods" will now talk about using H1, H2, H3, etc tags to tell the search engines what is the most important information about the page. In the image below you will see the home page of our website. You will see we have used "Heading 1" which the code uses an h1 tag for the first few words in the website ("We Provide Web Design and Development"). This provides an immediate emphasis to the search engines about what we do using our most important keywords. 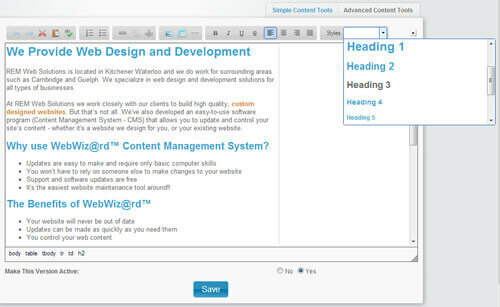 You can then use "Heading 2" which the code uses an h2 tag for important but less important keywords. This should be done throughout your website. In the next Newsletter, I will be talking about changing your content often and some easy ideas on how to do it. We would like to announce our latest module - the locations Module! The locations module is fantastic for any business that has multiple locations - or even for companies that use multiple distributors! It instantly shows visitors to your website exactly where you are located on the map, along with any other details specific to your business. We have also included a full, location-based search engine to help visitors instantly find the locations closest to them. If you would like to find out more about the Locations module, or if it is right for your business, please contact us at sales@remwebsolutions.com or call us at 519-884-4111. With Thanksgiving over and Halloween just around the corner, it may be time to clean out any skeletons left on your website! REM Web Solutions can help! Contact us with any questions you may have. We are continuing to roll out our new version of WW 3.5 to existing WebWiz@rd clients. If you have not yet been contacted, please be patient as we complete the migration process for each site. We post new blogs each week. Each post is written by one of the REM team members! Read the posts here.